Contributors. Preface. VLSI Signal Processing. Recurrent Neural Networks for Adaptive Filitering. Multiscale Signal Processing: From QMF to Wavelets. The Design of Frequency Sampling Filters. Low-Complexity Filter-Banks for Adaptive and Other Applications. A Discrete Time Nonrecursive Linear Phase Transport Processor Design Technique. Blind Deconvolution: Channel Identification and Equalization. Time-Varying System Identification and Channel Equalization Using Wavelets and Higher-Order Statistics. Index. 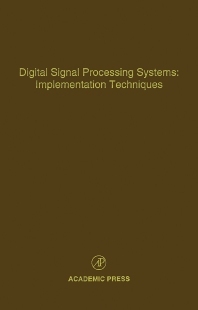 This volume on implementation techniques in digital signal processing systems clearly reveals the significance and power of the techniques that are available, and with further development, the essential role they will play as applied to a wide variety of areas. The authors are all to highly commended for their splendid contributors to this volume, which will provide a significant and unique international reference source for students, research workers, practicing engineers, and others for years to come. AUDIENCE: Electrical Engineers in digital signal processing.